We’d love your help. 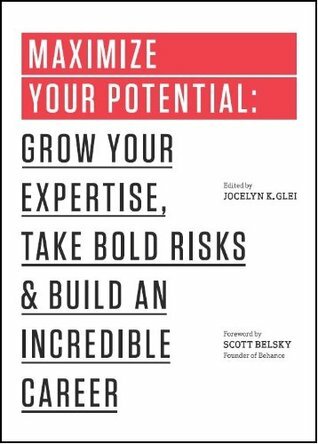 Let us know what’s wrong with this preview of Maximize Your Potential by Jocelyn K. Glei. With wisdom from 21 leading creative minds, 99U's Maximize Your Potential will show you how to generate new Success isn't about being the best. It's about always getting better. To ask other readers questions about Maximize Your Potential, please sign up. Maximize Your Potential is a shallow collection of short essays written by some experts and mostly psuedo-experts citing case studies and unsourced "studies show" to make a case for its many obvious claims. The book is dedicated to "those who strive". I'd argue those people, with whom I identify, are disappointed by the content in this book. With advice like be the better you and cultivate your luck quotient, how could we not be? So as not to be completely derisive, I will point out a couple hig Maximize Your Potential is a shallow collection of short essays written by some experts and mostly psuedo-experts citing case studies and unsourced "studies show" to make a case for its many obvious claims. The book is dedicated to "those who strive". I'd argue those people, with whom I identify, are disappointed by the content in this book. With advice like be the better you and cultivate your luck quotient, how could we not be? So as not to be completely derisive, I will point out a couple highlights from the book. The idea that one should build skill as a prerequisite for finding or following passion is novel and requires further thought. I also appreciated the article that outlined five questions for building good ground rules on which solid working relationships can be built. I will certainly try it out. Overall, this 99U book is a good read. It is what I like to call a "cocktail" of modern career advice. If you aren't following a lot of the Tim Ferriss' of the personal development era, then these collections of essays will be very rewarding. While each essay holds up well, if you are familiar with a lot of these writers, then you might not get as much excitement from the material. But that isn't to say it isn't worth the read. Given its length, it's still worth reading and having that informati Overall, this 99U book is a good read. It is what I like to call a "cocktail" of modern career advice. If you aren't following a lot of the Tim Ferriss' of the personal development era, then these collections of essays will be very rewarding. Seriously, there're no words enough to explain the greatness of this book, a fabulous compilation of stories, lessons and teachings of some rare and successful persons. Simply, bcoz earlier one was beyond my expectations and this one is some what repetition and extension of earlier book. Kurikulum yang hilang. Buku yang mesti dibaca berkali-kali. While the tips in this book are new enough to the business world to avoid being cliche, there are still very few concrete and actionable tips for an ordinary individual to use. For instance, what does "accept uncertainty" mean in a person's career? How do you put that into practice. This book, like many other self-help books, fails in that regard. A few of the contributors did offer helpful and practical advice though, so the book wasn't a total bust. Disclaimer: I received a free copy of this bo While the tips in this book are new enough to the business world to avoid being cliche, there are still very few concrete and actionable tips for an ordinary individual to use. For instance, what does "accept uncertainty" mean in a person's career? How do you put that into practice. This book, like many other self-help books, fails in that regard. A few of the contributors did offer helpful and practical advice though, so the book wasn't a total bust. I actually enjoyed this book way more than the first one! It was full of great advices, examples and questions that you need to constantly keep in mind. I think that's why I am into self-help books, because you need to keep hearing the same advice over and over. Habits aren't created in one day, you constantly need to strive for progress, and the results don't come overnight. So, if from this book I learn and use just 1% and then from another book 1%, eventually I'll see improvements in my day-to-day life. Considering that the book isn't too long, you can't really expect a deep analysis, but what is in the book is valuable, at least for me. The first book of Maximize Your potential was more impressive for reading, however a lot of inspiration and bright ideas could be found in this book as well. I would imagine that in various stages of my live the book gives me different information and different insights of my life attitude. The possibilities are infinite. But so, too, are the responsibilities. Having that abilitiy brings the lead of your own development on to you, do not wait for the manager,that would gu The first book of Maximize Your potential was more impressive for reading, however a lot of inspiration and bright ideas could be found in this book as well. I would imagine that in various stages of my live the book gives me different information and different insights of my life attitude. The possibilities are infinite. But so, too, are the responsibilities. Having that abilitiy brings the lead of your own development on to you, do not wait for the manager,that would guide you to your greatness. Passion is not a profession, it is a way of working. To achieve a lifestyle that you love, start by cultivating rare and valuable skills that will set you apart. Plan flexibly, and be ready to pivot in your career if necessary. Always have a Plan A, B and even Z in your back pocket. Try to regularly disrupt your own status quo. If you are getting too comfortable in your current position, it is probably time to challenge yourself in new ways. Think about your work -and where are you going-in terms of a larger mission. A job title is a closed objective, but a mission can grow with you. Expose yourself to new situations, keep an open mind, and be proactive about pursuing chance opportunities. Luck comes to those who seek it. Calibrate your career for maximum impact by working at the intersection of your genuine skills, interests and opportunities. Stop trying to "BE GOOD"
Give yourself permission to screw up. Once you stop trying to be good (and look smart), you can focus on tackling the exciting challenges that will help you GET BETTER. Change your mindset from pursuing "Be good" to "Get better"! Set aside time for regular sprints where you work intensively on a key project or skill without distraction. Then reward yourself with a break. Focus on practising the hard stuff when you are developing new skills. As with the weight lifting, you know you are making headway when you feel the burn. Develop a method for gathering feedback - whether is is tracking the numbers yourself or hiring a coach. No factor is more essential to growth and learning. Try to change on key habbit a month. If you can make the behaviours that help you excel automatic, executing at the top of your game becomes significantly easier. Track you progress by journalling for a few minutes every day. The practise will help you identify stumbling blocks, observe patterns, and document successes. Seek out fellow travelers - trusted colleagues and collaborators whon you can ask for help, who will tell you the truth, and who will hold you accountable. Address what could go wrong in a creative relationship up front. Then, when a conflict does arise, you have created a comfortable space for talking about it. Focus on how you can help others, and lasting connections will come. The true spirit of networking should be generosity, not obligation. Asking always precedes connecting, and if you do it regularly, your network will thrive. Make a weekly habit of reaching out to people whom you admire. Build on-and improvise with-others' ideas and skill sets. If you let everyone shine in his or her are of expertise, your projects will thrive. Try to assemble creative teams that include both veteran collaborators and newbies. Diversity (in the right dosage) accelerates your creative potential. Be aware that when you fail, you will adapt to the new situation much more quickly than you expect. Fear a failure to act more than you fear failure itself. Most people's buggest regrets are the opportunities they did not act on, no those they did. Try to make small bets for the inital test-rns of your project or idea. IT is hard to predict what will take off, and this limites exposure to risk. Mine your "failures" for valuable data about what works and what does not. As lons as you learn form the process, it is not a mistake. Don not be afraid to live in the shade of big questions. Uncertainty and ambiguity are a necessary part of risk-taking and the creative progress. Embrace your power to make the outcome of any risk a success. Almost any situation can be turned around with persistence and ingenuity. Reading 99U books (there are 3 of them so far) is like going to a creative conference inside a book. There are carefully selected speakers with different background and expertise, talks are short and right to the point. There are talks that are relevant to you, and also there are ones that are not so. But overall, there are always things you can take away, you want to jot down to your notebook (or underline in the book). And, just like 99U conference, talks are not superficial motivational BS. T Reading 99U books (there are 3 of them so far) is like going to a creative conference inside a book. There are carefully selected speakers with different background and expertise, talks are short and right to the point. There are talks that are relevant to you, and also there are ones that are not so. But overall, there are always things you can take away, you want to jot down to your notebook (or underline in the book). And, just like 99U conference, talks are not superficial motivational BS. They give you ideas and tips, but they also tell you to work real hard to achieve the goals. Extremely useful. This book, along with the first in the series - "Manage Your Day-to-Day" - is a well-selected set of short articles from a wide range of productive, creative people. It's a short, engaging, interesting read that delivers very valuable, practical wisdom. If you can get past the terrible foreword (which makes it sound as if the book was written for entitled pricks), this is actually a great list of thoughts and action items on various important topics for someone's career. A good read in short chunks. More for the guy, who is debating whether to take the next big step...or not. This was a quick and fairly useful book. There are several useful practical steps and insightful ideas presented. The structure of the book was problematic because the chapters were so short and always ended with a short description about the author and their work. It seemed like having commercials in between each of the lessons. The overall effect was that the 'story' of the book was disrupted and it seemed like small sound bites of information from different people rather than a coherent and c This was a quick and fairly useful book. There are several useful practical steps and insightful ideas presented. The structure of the book was problematic because the chapters were so short and always ended with a short description about the author and their work. It seemed like having commercials in between each of the lessons. The overall effect was that the 'story' of the book was disrupted and it seemed like small sound bites of information from different people rather than a coherent and consistent manual for "maximising potential". This is an incredible book, and by far one of my favorite and most useful books on my bookshelf. To first give context, this book is a series of short essays by 21 different thought leaders. The essays are organized by the topic of professional advice: 1. creating opportunities, 2. building expertise, 3. cultivating relationships, and 4. taking risks. This makes it especially useful and unique because you get such a diverse range of advice, research, case studies, and storytelling that very effe This is an incredible book, and by far one of my favorite and most useful books on my bookshelf. To first give context, this book is a series of short essays by 21 different thought leaders. The essays are organized by the topic of professional advice: 1. creating opportunities, 2. building expertise, 3. cultivating relationships, and 4. taking risks. This makes it especially useful and unique because you get such a diverse range of advice, research, case studies, and storytelling that very effectively and eloquently streamline thousands of articles you'd find online on these topics. I plan to re-read this book often and out of order as it's formatted in a way to easily pick it up, find the advice applicable to whatever professional or creative problem you're experiencing, and reinforce productive habits. The essays are motivational and extremely wise while avoiding all the typical "self-help book" fluff. “Follow your passion” may be the most common advice job seekers received, but many would have heed it to their own detriment. Unfortunately, chasing our passion might turns out not to be relevant to most jobs,though other strong motivations may prevail. There're several valuable points to learn from the book, but they don't go into detail so basically, don't expect much! This book is suitable for someone who's at the beginning of a career and want to have a good glimpse of planing his/her career journey. I am absolutely in love with the author's writing but the book is rather too shallow in general. Solid advice on career building, self improvement (with the help of peer groups), risk taking and cultivating creativity. The used blog/interview format I found very easy to follow and the advice comes from true life experts (who accomplished what they teach you). I will reread this one, just as I did with the first book in the series Manage your Day-to-day. Neither was it a groundbreaking, nor thought-provoking book to me. If you read business related articles and/or books, you would have already encountered some of, if not all, the ideas this book tries to convey to its readers. Henceforward, I would suggest a potential reader to invest their time into a book that may provide more contemporary and unique ideas than this book does. This is a great book for anyone out there that wants to build a strong career for themselves. It is full of great tips, advice, and research from all kinds of successful people in a wide range of fields. I would highly recommend, especially if you are someone who maybe fells lost or is doubting their ability to create something successful for themselves. An easy read with some practical business tips. However, nothing earth shattering and unfortunately ends with a Bill Cosby quote, which made me seriously question why they couldn't have done a reprint with a new end page. Cuốn này rất gần gũi với công việc trong ngành quảng cáo. Cực kỳ hữu ích với nhiều lời khuyên hợp lý, dễ thực hiện, từ những thay đổi nhỏ và thực tế. Nếu bạn đang loay hoay với những bế tắc trong công việc thì hãy đọc nó. Great advices for antes creative mind trying ti improve life and work. I liked very much the direction and simple language. Each chapter features a different author/expert with a unique but complimentary point of view. A quick, but thought provoking read. This review has been hidden because it contains spoilers. To view it, click here. The last quote in the book is from Bill Cosby and has kinda a double meaning now. Otherwise, the book has good advice on limiting believes, choices, and productivity.